Claiborne “Clay” Thompson approaches the age-old hypothetical question: “What wine would you bring to a desert island” with startling decisiveness. He and wife, Fredericka Churchill, named their cat “Riesling,” after all. This should be a strong indicator of just how deep their obsession with the wine grape runs. NUTTY PROFESSORS: In the early ’80s, Claiborne “Clay” Thompson and his wife Fredericka Churchill ditched their careers as University of Michigan professors and planted winemaking dreams in Edna Valley’s fertile soil. If I had asked, “What wine would you bring to a remote cabin with a fridge packed with wild boar and deer sausage,” Thompson might have said “pinot noir,” although I cannot be entirely sure (it’s a little known fact: Clairborne & Chuchill has been churning out incredible pinots since 1989). Funny, straight forward, and gregarious, Thompson is not simply a man who loves to joke around at fancy wine club dinners. He’s a self-made winemaker and retired University of Michigan Norse Languages professor (the winery’s popular limited production “Runestone Pinot Noir” pays homage to this). Fredericka Churchill is the other half of the Claiborne & Churchill name, with sparkling eyes and an eloquent way of telling the most story with the least fat (also a former University of Michigan German language professor). Of course, real life—and Midwestern winters—can be a drag from time to time. As the well-worn story goes, the duo jumped ship to make wine in Edna Valley. They year was 1981. Three years later, much to the jealously of shivering friends and colleagues, the couple opened their passion project: Claiborne & Churchill Winery. And the rest is history. Or, not quite. In the 1980s, many folks had yet to encounter a riesling, let alone a dry one (and the same can be said about almost-impossible-to-pronounce gewürztraminer). The winery owners still hear comments like this. Now, they can take comfort in the fact that their famous whites—modeled on the dinner wines of the French province of Alsace—are coveted by folks across the globe. So how did an academic become a winemaker? And what about those pinot noirs I foreshadowed earlier? I’m getting on with it. In the wine wilderness, there is no animal more compelling than the “cellar rat:” the semi-clueless guy or gal passionate and hardworking enough to clean tanks, push down barrels, and screw things up again and again until he or she gets it right. That was Thompson, in the beginning of his winemaking career at Chamisal Vineyards (current Claiborne & Churchill head winemaker Coby Parker-Garcia also followed in those proud footsteps). “Sometimes the student learns more than the teacher, and that’s a good thing,” Thompson said of his years instilling “The Claiborne & Churchill Way” into his protégé. Parker-Garcia became a full-fledged winemaker in 2007, although he had been doing much of the work since 2004. GO TO THE DARK SIDE: You may be well aware that Claiborne & Churchill Winery is known for its world-class dry Riesling and dry gewürztraminer. However, winemaker Coby Parker-Garcia is producing an array of handcrafted pinot noir that provides fantastic contrast to those crisp whites. Now, I’m going to talk a bit about that “way” of winemaking, so feel free to skip ahead if you’re not a wine buff. A naturally high-sugar, cool-climate grape, German gewürztraminer is often made flamboyantly sweet. Thompson went the other route—looking to showcase true-to-varietal spice and aromatics and dry flavor. Reisling, from the Rhine region of Germany, is often served in fussy, sugary sparkling white wines. Bletch. Thompson went less “grandma’s perfume” and more “aromatic and refined”—always with an emphasis on showcasing the grape’s incredible ability to reflect the land from which it was born. For all you beer drinkers out there: Aren’t you glad I didn’t say terroir? Claiborne & Churchill now produces about 10,000 cases of wine a year, including chardonnay, syrah, cabernet sauvignon, pinot gris, dry muscat, and edelzwicker (another fun one to pronounce). Also on that list: Thoughtfully-crafted pinot noir, a grape ubiquitous in the Edna Valley, but not one you would normally connect to a white wine destination like Claiborne & Churchill. Could this pinot noir be the yin to reisling’s yang? After trying the four-bottle pinot noir lineup, I think it very well could be. I might add their popular 2014 Cuvée Elizabeth—a blush-colored dry pinot noir rosé—is available now for those hot afternoons ahead. “Twin Creeks” refers to five separate family-owned vineyards leased by the winery. Claiborne & Churchill dictate the exact farming practices desired, creating a situation akin to owning an estate vineyard without actually having to commit to putting all your eggs in one basket. Interesting clones, thoughtful blending practices, and meticulous care go into each and every bottle. Parker-Garcia, who only narrowly escaped a hectic life as an international produce broker (he said it eventually came down to whether he “wanted to either grow wine or sell spinach”), loves the fact that he gets to play with an array of fruit from across the Central Coast. 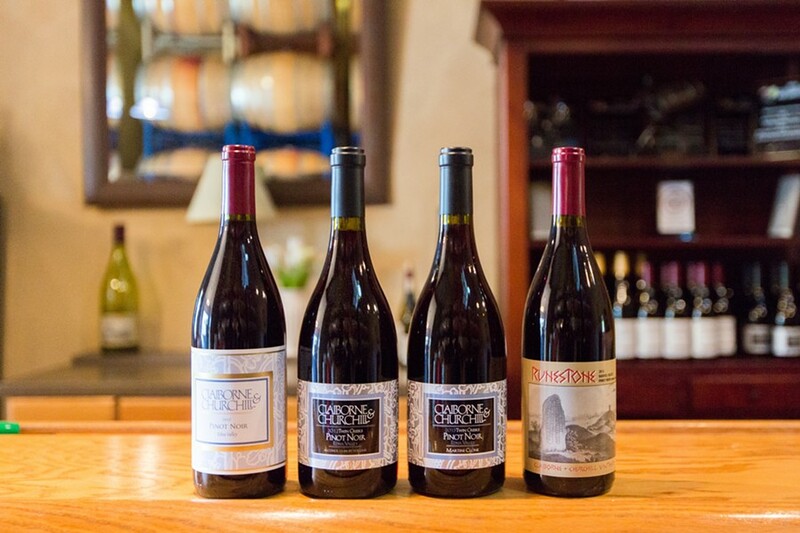 Both Thompson and Churchill can still remember when even “pinot noir” was a strange term in Edna Valley—a wine that restaurants wouldn’t take if you gave it away. Sipping their new, 2013 Twin Creeks Martini Clone Pinot Noir in the winery’s eco-friendly straw-bale building tasting room (built with 16-inch-thick walls made of rice-straw bales) I think to myself how different Edna Valley would be if those two crazy professors hadn’t thrown caution to the wind. 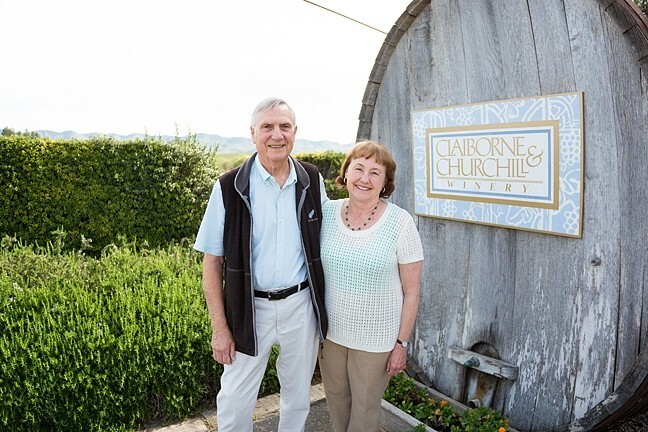 Claiborne & Churchill Winery is now 32 years old—about the same age as their marriage, and just as strong. “We got married, moved out here, and started new jobs all in the same week,” Thompson said. “The most amazing thing I saw in the wine industry was the fact that winemakers didn’t distinguish work from fun. Going to work was something they wanted to do. They never considered it a burden or an obligation,” Thompson said.